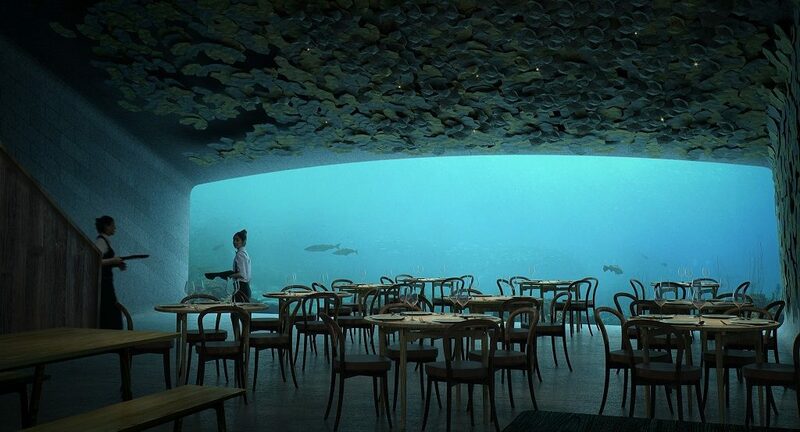 Fancy dining on seabed 5m below water surface? As visitors begin their journey through the restaurant, they descend via three levels. From the entrance, where the tidepool is swallowed by the sea, they enter the wardrobe area where they are ushered down one level to the champagne bar which marks the transition between the shoreline and the ocean. A narrow acrylic window cutting vertically down through the restaurant levels emphasises this physical transformation. From the bar, guests can also look down at the seabed level of the restaurant where two long dining tables and several smaller tables are placed in front of the large panoramic window. As you enter the restaurant on a day of rough sea, you can feel fresh, salty ocean spray against your face. The restaurant’s colour palette follows the logic of the different storeys of the construction. The champagne bar’s colours are inspired by the coastal zone with its subdued hues of the sediment of shells, rocks and sand. The dining room is submerged in darker blue and green colours inspired by the seabed, seaweeds and rough sea. The restaurant interior’s warm, locally sourced oak contrasts with the rough concrete shell, creating an intimate atmosphere. All the materials are chosen for their aesthetic qualities, sustainable characteristics and ability to create a good indoor climate, according to the website of Snohetta, an international integrated design practice. 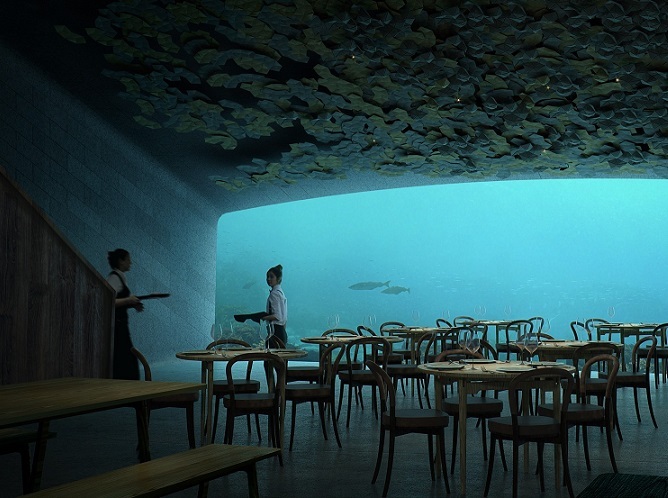 This is Europe’s very first underwater restaurant. The project is named Under, which has a double meaning; in Norwegian, “under” can be translated into “wonder”. 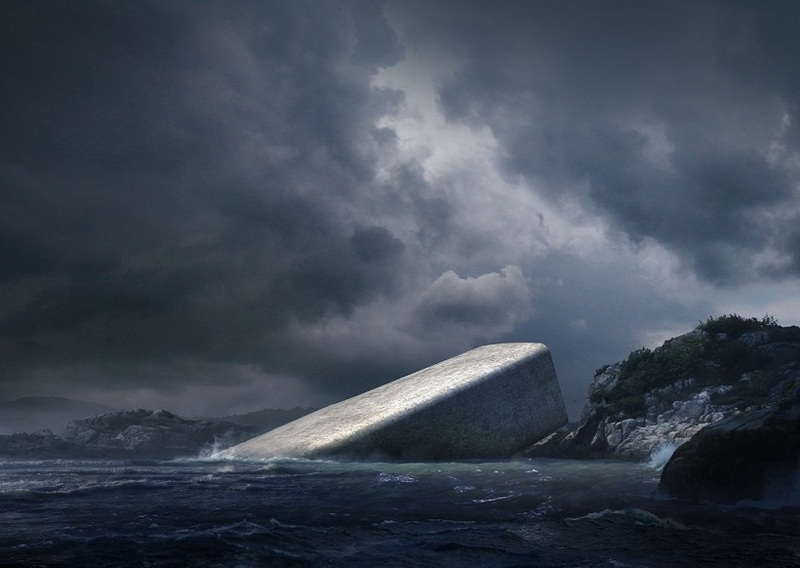 Half-sunken into the sea, the building’s monolithic form breaks the water surface to lie against the craggy shoreline. 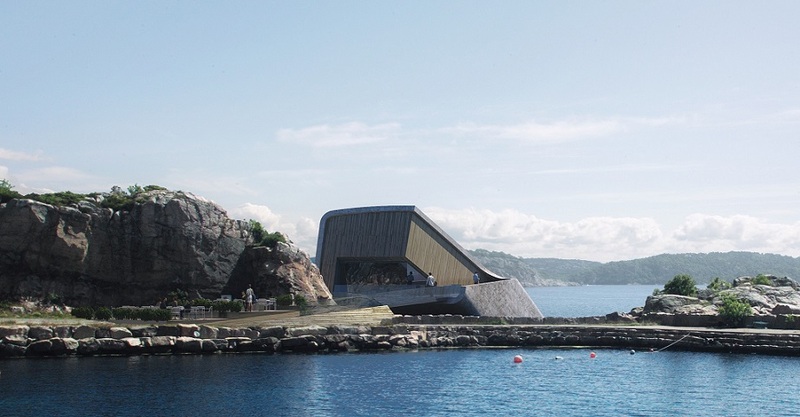 Situated at the southernmost point of the Norwegian coastline by the Baly village and with its immediate proximity to the forces of nature, the restaurant will also function as a research centre for marine life. It’s a tribute to the Norwegian coast, the wild fauna of the sea and the rocky coastline of Norway’s southern tip. More than an aquarium, the structure will be a part of the marine environment, resting directly on the seabed 5m below the water surface. With meter-thick concrete walls, the structure will be built to withstand pressure and shock from the rugged sea conditions. 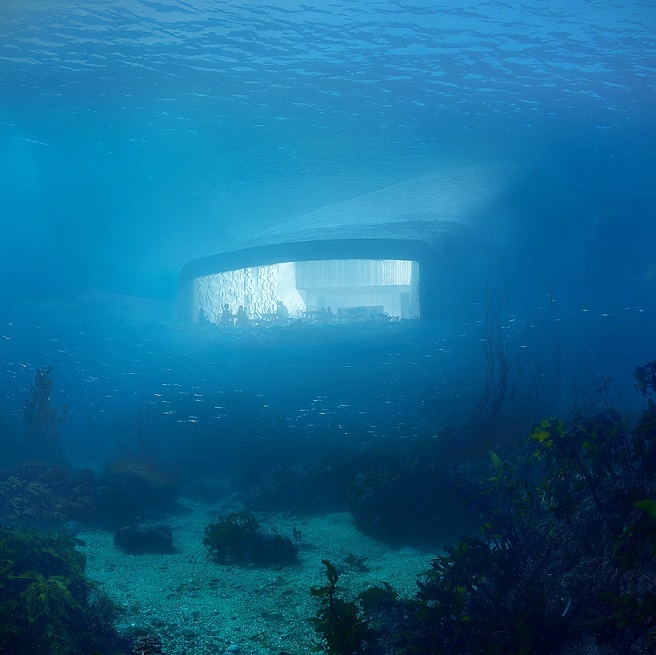 Like a periscope, the restaurant’s massive acrylic windows offer views of the seabed as it changes throughout the seasons and varying weather conditions. 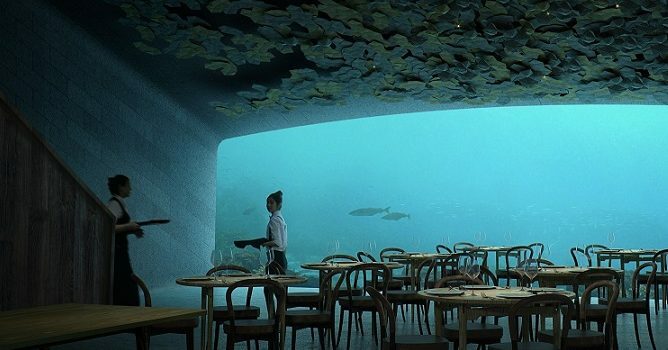 Under, through its architecture, menu and mission to inform the public about the sea’s biodiversity, will provide an underwater experience of awe and delight. Snohetta said it has designed Under with sensitive consideration for the building’s geographic context and aquatic neighbours. The building can comfortably accommodate 80-100 guests while the lighting on the seabed will help stage the wildlife flourishing on the sandbank. The sleek form of the building is encapsulated in a concrete shell with a coarse surface that invites mussels to cling on. Over time, as the mollusc community densifies, the submerged monolith will become an artificial mussel reef that acts dually to rinse the sea and naturally attract more marine life to its purified waters. The restaurant will also welcome research teams studying marine biology and fish behaviour. The building can accommodate 80-100 guests. Muted lighting from the inside of the restaurant and installed on the seabed will help stage the wildlife flourishing on the sandbank outside of the 11m by 4m panoramic acrylic window. The building’s coarse concrete shell invites mussels to cling on and form an artificial reef that attracts more marine life. © Property360 2016-2018. All Rights Reserved.